From zeroing in on the best means for stake dilution to moving beyond microfinance, Bandhan navigates a tough path. Back in 2010, when Bandhan Bank was still a microfinance organisation, it could preempt the first ever crisis in the sector. An ordinance by the Andhra Pradesh government curbed nearly 70 per cent of the microfinance operations, followed by strict limits on lending and collections. The unregulated nature of the sector had led to lending at unreasonably high rates and coercive methods of payment collection, prompting Andhra Pradesh to promulgate the ordinance. Six months before the state had passed the ordinance, however, Bandhan took a step that few had contemplated: it reduced lending rates by about five percentage points — the lowest in the sector at 19.1 per cent. Within the next year, Bandhan emerged as the unrivalled leader of microfinance as its competitors struggled for breath under the weight of bad loans. Cut to 2018. Bandhan faces its first big challenge as a bank. The Reserve Bank of India has put curbs on its branch expansion plans, for failing to meet shareholding norms for new private banks. Further, the remuneration of C S Ghosh, its MD and CEO, has also been frozen at the existing level. Ghosh, the face of the bank, has been a conservative and foresighted banker. He has been able to handle difficult situations with remarkable ease. But the next few months, as well as years, could put his leadership skills to the test. It is, however, not the RBI stricture on expansion, but the bank's own business model that would be his biggest challenge. The curb has come at a time when Bandhan Bank has already met most of its initial targets. Over the last three years, the bank has expanded aggressively. On the first day of its operations itself, it rolled out 500 branches. Against the target of 1,000 branches by March 2019, it has already reached 938. Additionally, the bank has a wide network of doorstep banking centres (DSCs) from its microfinance days, which form its foundation. The cost of operations here have remained low. Ghosh has been so frugal in maintaining strict cost-controls at DSCs that as an MFI a branch manager was entitled to a plastic chair with armrests, while credit officers got chairs without armrests. A strict cost control model is still followed. Even now, large number of Bandhan's field staff comprises local class 12 pass-outs, which means low salary expenses. In the six months from March this year, the bank opened 246 DSCs. Its customer base has doubled from 8.4 million at the end of March 2016 to 14.41 million at the end of September 2018, and its microfinance business has grown from about Rs 100 billion to more than Rs 300 billion in the same period. Notably, the RBI curb is on branches and it is not clear if it is applicable for DSCs. All this growth has been achieved with the best asset quality in the industry. It has a nearly 99 per cent repayment rate. Bandhan Bank's net interest margin is about 10.3 per cent, way higher than its peers, like Yes Bank (NIM of 3.3 per cent) and IndusInd Bank (NIM at3.92 per cent). However, Bandhan Bank's growth, although impressive, hasn't been well-rounded. Three years into universal banking, it still relies heavily on microfinance. About 86 per cent of the bank's loan outstanding is in the microfinance segment. Moreover, its operations lean heavily on the eastern and north-eastern regions. 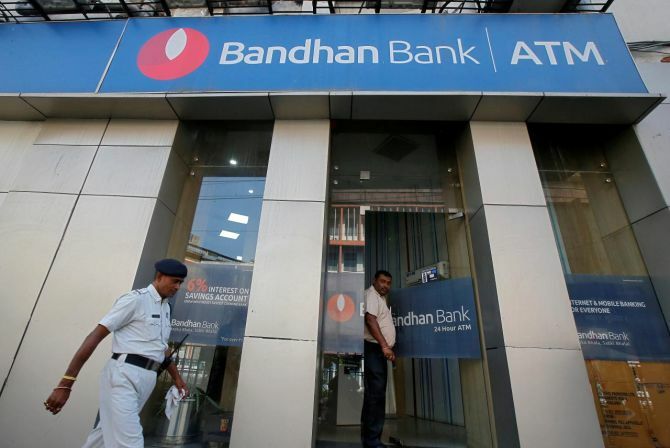 About 64 per cent of Bandhan's branches and 80 per cent of its loan book are concentrated in the east and north east. North accounts for a mere 4 per cent, south 2 per cent, central 8 per cent and west just 6 per cent of the bank's loan book. Once eastern India market gets saturated, and Bandhan Bank expands in other regions, it will face a level-playing field in the new terrains as several private banks have now entered its niche of microfinance. Kotak Mahindra Bank has acquired BSS Microfinance, IDFC Bank has acquired Grama Vidyal Microfinance, DCB Bank has acquired a stake in Annapurna Microfinance, and IndusInd Banks is awaiting regulatory clearances for its acquisition of a stake in Bharat Financial Inclusion, formerly SKS. The limited corporate lending by Bandhan Bank has already proven to be a risky bet. Bandhan Bank has about Rs 3.8 million exposure to infrastructure lender IL&FS, which is facing acute liquidity crisis (so far a standard asset). Sunil Samdani, chief financial officer of the bank, told analysts in an investor call that the loan was an "exception". In the days ahead, another challenge for Bandhan would be to find the right way to dilute promoter share. The promoters' shareholding at Bandhan Bank is about 82.28 per cent, which needs to be brought down to 40 per cent. Some of the options listed by the bank to bring it down include acquisition in the microfinance or housing finance space and entering new business at the holding company level. Recently, the Securities and Exchange board of India relaxed the one year post-IPO lock-in period norm for Bandhan, which means the promoters can now directly sell equity shares; an additional option for the bank. Further, at the holding company level, Bandhan Bank can now engage in share transactions to enter mutual fund or insurance business. However, these will be relatively new and riskier ventures for the bank, which has its expertise in microfinance. Any tweak in the shareholding structure of the bank might also go against the holding company structure of banks favoured by the RBI. Secondary sale of shares would mean more capital, which at this point is not needed by the bank. "Any further issuance in the bank will depend on the requirement of capital in the bank to grow the business. Our capital adequacy as on June 2018 was 30 per cent plus, so currently we are adequately capitalised for the growth of our regular business," Samdani said in the analyst call. Bandhan Bank has indicated its willingness to go for inorganic growth to meet the RBI norms. "If there is an opportunity of any inorganic opportunity which makes sense for the bank and its shareholders, we will look at raising capital at the bank level," added Samdani. Experts say an MFI could be an ideal fit for acquisition, given the synergy in operations, need for the bank to expand beyond east and north east and its huge capital base. However, finding the right fit for acquisition in a short time is no easy task. From zeroing in on the best means for stake dilution to moving beyond microfinance, a banking licence for Bandhan has come with many challenges.